A few weeks ago, I received an email from a music director asking for ideas and suggestions for a Christmas program for her small adult church choir. I had already planned to write this post sometime later this month, so I thought I'd share my thoughts and ideas now, in case some of you have the same questions. Also, I'm using this post to kick-off a mini "Christmas in August" series, so grab a cup of hot chocolate (or iced mocha) and enjoy! The first step in planning a Christmas program, I think, is choosing a format. What kind of Christmas program will this be? What resources are available to you? Who will participate? He Is Born - Emmanuel! Create your own mini cantata or musical by choosing five anthems or carol arrangements and inserting narration or story-telling in between. Choose music that helps tell the story. Bonus points if you underscore the spoken sections with music that leads into the next piece! With plays and skits, the focus is often on retelling the Christmas story (sometimes, a more modern retelling). This is a great way to include congregation members of all ages who may or may not sing or play musical instruments. The choir and/or congregation may sing anthems, hymns, or carols in between scenes. Here is a very simple script you can use to get started. Make it your own by creating scenes, adding musical cues/sound effects, adding costumes and props, or updating the text to make it more modern. Perhaps the most traditional Christmas program format, the Lessons and Carols model dates back to the late 19th century (source). The well-known Festival of Nine Lessons and Carols at King's College Chapel began in 1918 and continues to this day. The King's College Chapel service always begins with "Once in Royal David's City" and incorporates a new composition, incorporating both choral anthems and congregational hymns and carols. Write your own lessons and carols service using your favorite choral anthems and congregational hymns, interspersed with the traditional readings. St. James Music Press has a few templates you can use to get started (Advent and Christmas). Or, plan a simple program with readings and congregational carols, as outlined in this sample from PCUSA or this one from Discipleship Ministries. Alternate musical selections and Scripture readings, poetry, prayers, or book excerpts, or write your own simple narration (or identify someone in your church who has this gift) based on the text of the music and hymns/carols you choose. Choose some pieces of music for your choir(s), and add in a few instrumental pieces, solos, a piece for handbells, congregational singing etc. If your church is small with limited resources, consider using orchestral accompaniment tracks for an added special effect. If you have a capable instrumentalist (or several!) - flute, trumpet, saxophone, violin, oboe, etc. - consider adding an instrumental obbligato on a few familiar carols. Choose an anthem for the women of your choir to sing alone and one for the men to sing alone. You might choose to do a traditional lessons-and-carols format, which I love, or you could choose music based around a central theme, such as light, peace, carols from around the world, etc. Mix it up from year to year. Consider doing a shorter program (15-20 minutes) in the middle of the service. Another option is to combine with another local church choir and do an afternoon program sometime during the month of December. Plan some sort of processional (a hymn or repetitive anthem that the choir can sing as they process in or a handbell processional - here’s a free one for 16 bells). Have children reenact the nativity scene during a particular anthem or carol. Surround the congregation for a prayer or quiet carol. Use banners, streamers, candles, handbells, etc. Here are a few other ideas. 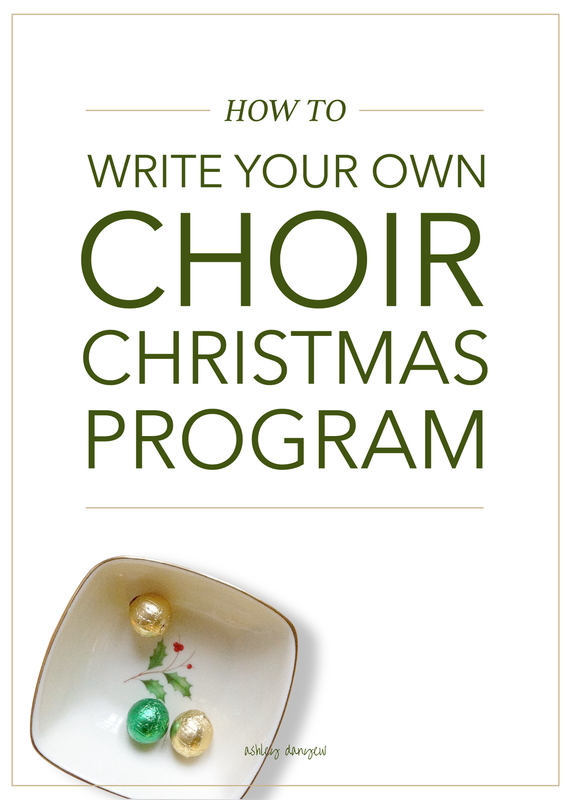 Have you ever written your own Christmas program? If not, would you ever consider it?